FACULTYBOX-WEEKLY is a weekly news bulletin that has been launched by Facultybox, providing top trending news and articles in order to help faculties and students to have an overview of important things happened during the week. 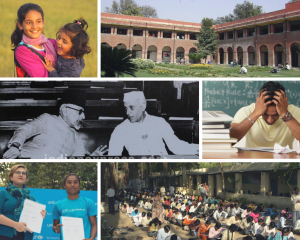 Check out the top trending news regarding NATIONAL EDUCATION DAY. The Nation celebrates National Education day on Nov 11th as a mark to respect our first Vice President Maulana Abul Kalam Azad. He was also the first education minister of India from 1947 to 1958 .Bharat Ratna was awarded in the year 1992 for his contribution as an educationist and freedom fighter as well. Abul Kalam Azad strongly advocated the education for women. He is also responsible in establishing most of the major cultural and literary academies we have today, including the Sangeet Natak Academy, Lalit Kala Academy, Sahitya Academy as well as the Indian Council for Cultural Relations. The first IIT, IISc, School of Planning and Architecture and the University Grants Commission were established under his tenure. During the recruitment exam organized by APPSC few aspirants were on a protest to postpone the exam. Police used water cannon to disperse the candidates. A section of the candidates decided to boycott the examination saying they are not in a mental state to appear for the examination. They demanded that the mains examination is held only after the final verdict of the high court is out. The APPSC has rejected the demand and the results were declared within a week but a section of the candidates who did not make the list for the mains exams moved court. Under the government’s ‘padho Punjab, padho Punjab,’ learning enhancement programme it has been revealed that it performing very badly. The baseline test Is conducted for Class IX an X in 4 subjects – English, Mathematics, Science and social science. This test is conducted recently to check the minimum learning level of students and the results are really bad. The state education department is blaming the ‘no-detention policy’ under the Right to Education Act (RTE) . Due to which no student is detained or failed till Class VIII. 1.65 lakh students of Class X and 2.18 lakh students of Class IX were tested in the baseline exam. Andrew Markwick, a lecturer in the School of Physics and Astronomy at the University of Manchester, has come up with a simple system for teachers. The software allows teachers and other university staff to view and amend different data on the students that relate to their well-being. For example, some of the tell-tale signs a student could be at-risk are non-attendance, a drop in grades or failure to submit work at all. The software helps to figure out to utilize the data of students. This will help in identifying the risk of the individuals before they harm themselves. The Greater Hyderabad municipal corporation has circulated a form wherein it urged on behalf of the student to franchise their vote. The HSPA would look to launch a campaign to get all voters to “take an oath on education to vote for education” this time. The world organization tweeted on account of Children’s Day announcing the name of the woman athlete from Assam, Hima Das as the brand ambassador. The Jawaharlal Nehru University Students’ Union (JNUSU) has slashed its library budget from Rs.8 crores to less than Rs.2 crores . JNU doesn’t have funds to renew the subscription of e-journals, a crucial tool for research. JNU administration through Rector and Librarian have provided a detailed chart for privatization of Dr.B.R.Ambhedkar Library through massive fund cuts i.e. Rs. 8 crores to Rs. 1.7 crore,” said the union. Andhra Pradesh State Education Minister, Ganta Srinivasa Rao, announced the class 12/ intermediate exam time table this week. Exams will begin on February 27, 2019, and will continue till March 18, 2019. The second-year inter exam will begin on February 28, 2019. The practical exams will begin on February 1st. The ethics and human values exam will be held online on January 28. Exam for environmental science will be held on January 30.